You may receive multiple invoices due to amendments made to your bill. We are legally obliged to send every invoice for your records, however, you only need to pay the last one (the one with the highest invoice number). They should arrive at the same time so you can identify which one to pay. This covers the provision of a clean, fresh water supply. As you have a water meter, the charge is based on your recorded water use. You won't know exactly what you're going to be charged in every bill because the amount of water you use could go up or down depending on water use by your business or by using water saving appliances. You will be responsible for paying for any water loss as a result of leaks on your property or within your property’s boundary. These charges are based on the volume of water used by your business and the waste water disposed of down your drain. Waste water is typically calculated at 95% of the recorded water usage, as that’s what is estimated to go down the drain. Any business that is connected to the public water and sewerage system is required to pay a charge towards the cost of collecting and treating rain water from the property. These charges also cover your contribution to the public roads drainage system and helping to keep the roads free from flooding. Drainage charges in England can vary depending on the Wholesaler providing the service. 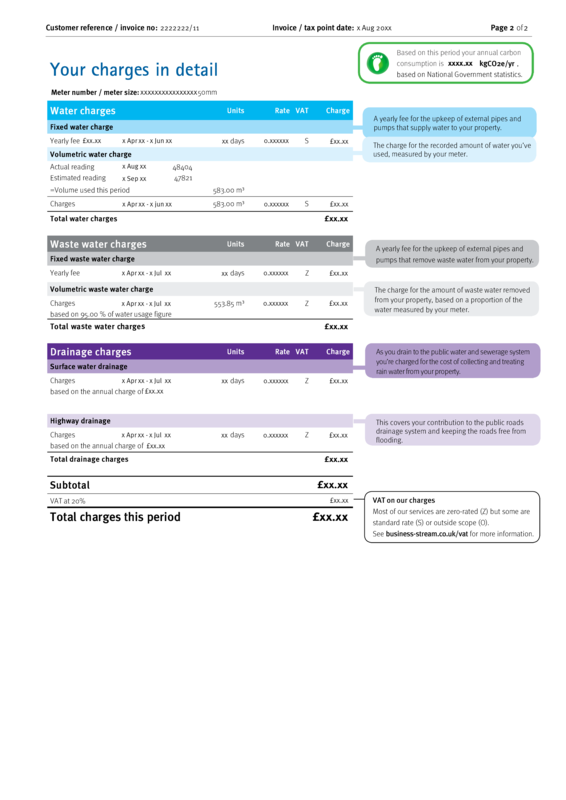 Got a question about Metered Bills in England? We’ve included our most asked questions below. The period of time that your charges cover is displayed on the first page of your bill, above the account summary section. This will usually be a three month period for metered customers, however this can vary depending on the tariff or payment option that you have. Why have I been billed based on an estimated meter reading? As a licensed provider of business water services, we’re required to read each customer’s water meter twice a year. 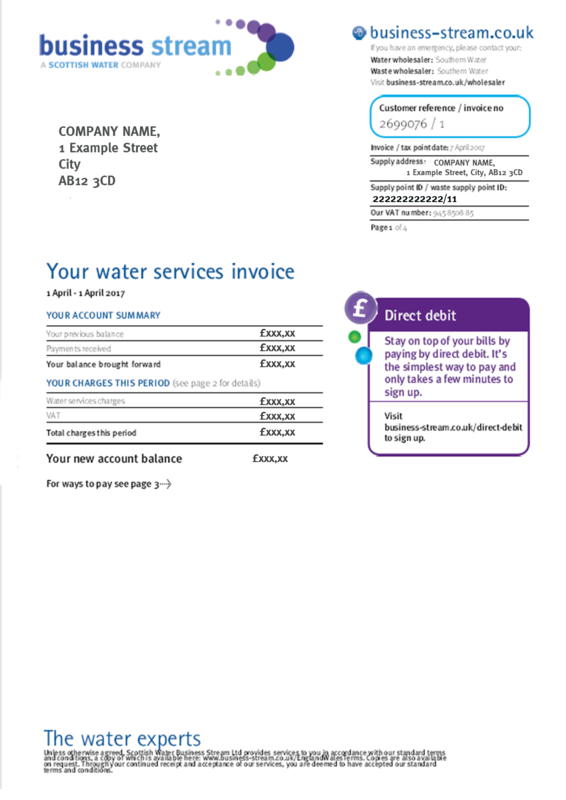 If you have received a bill that is based on an estimate meter reading, this will either mean that the bill is covering a period of time between meter readings, or that our engineers were unable to read your meter when they visited. If you would prefer not to have an estimated bill, you can provide us with your own meter reading over the phone or online. Please only read your meter if it’s safe to access your meter. After doing this, we’ll be able to re-issue your bill based on the actual consumption as determined from the readings that you submitted. Our bills are produced in numerical order, so even if you receive more than one on the same day, simply look for the invoice number at the top of the page. This can be found after the forward slash next to your customer reference number. Find out how to reduce your bill by visiting our water efficiency page, you can request a free water efficiency pack here too.